"Raw, captivating, and undeniably real, Nic Stone joins industry giants Jason Reynolds and Walter Dean Myers as she boldly tackles American race relations in this stunning debut. Then comes the day Justyce goes driving with his best friend, Manny, windows rolled down, music turned up—way up, sparking the fury of a white off-duty cop beside them. Words fly. Shots are fired. Justyce and Manny are caught in the crosshairs. In the media fallout, it's Justyce who is under attack." "You can’t change how other people think and act, but you’re in full control of you. When it comes down to it, the only question that matters is this: If nothing in the world ever changes, what type of man are you gonna be?" "He considers walking away again. He could call her parents, stick her keys in his pocket, and bounce. Oak Ridge is probably the safest neighborhood in Atlanta. She'd be fine for the twenty-five minutes it would take Mr. Taylor to get here. But he can't. Despite Manny's assertion that Melo needs to 'suffer some consequences for once,' leaving her here all vulnerable doesn't seem like the right thing to do. So he picks her up and tosses her over his shoulder. Justyce struggles to get the back door open and is lowering her into the car when he hears the WHOOOOP of a short siren and sees the blue lights. In the few seconds it takes the police car to screech to a stop behind him, Justyce settles Melo into the backseat." 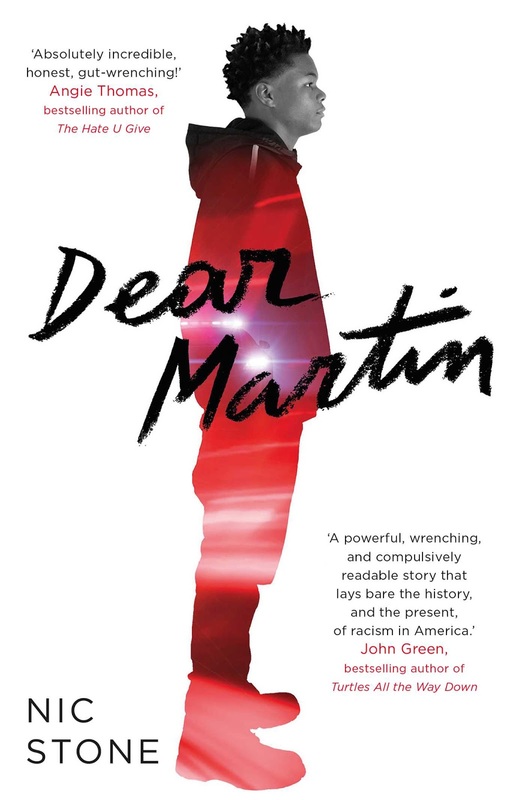 Published just months after Angie Thomas' The Hate U Give, Nic Stone's Dear Martin enters the same vein of socially-conscious young adult literature fighting for racial equality. While The Hate U Give takes the perspective of an eye-witness account during racial injustice, Stone's Dear Martin portrays the voice of the male victim of injustice himself. This perspective is extremely important and relevant to contemporary fiction and the world, however, I confess I did not love the voice of the novel. Justyce McAllister is a top student at a private academy bound for an Ivy League university but plagued by racism and injustice all around him. From a rougher, gang-filled neighborhood, Justyce has been able to gain a rare and phenomenal education, but he is surrounded by racism and ignorance, even from the people who he feels should know better. In an effort to learn how to cope with his situation and his feelings. Justyce begins writing a journal to Martin Luther King, Jr. (thus the Dear Martin of the title) hoping that meditating about his Civil Rights hero who preached for non-violent civil disobedience will enable him to rise up and respond how he wants to. Justyce struggles with how difficult this choice can be and ends up being confronted by the police twice, and during one of these episodes [spoiler alert] loses his best friend's life. The concept and heart behind this story are so important to share, but I struggled with the crass and crude language which seemed misogynistic and objectifying of women while simultaneously trying to advocate for equality. Perhaps Stone was trying to embody what to her felt like an authentic male voice, but this was off-putting. Nevertheless, the book is conversation-worthy and plays an important role in the contemporary racial justice movement happening in children's and young adult literature. I did not like it as much as The Hate U Give, and I would be selective in recommending it to audiences.